The number of bees in a honeybee colony ranges depending on the season. Sometime in the middle of the honey flow (April-July or so here in WV) a good colony will have somewhere around 60,000-80,000 bees in it. In the middle of winter, the colony will only have 20,000 or so bees. Typically, the more bees there are in a colony, the more honey they can make. So, sometime around the end of January or the beginning of February, the queen starts to ramp up her egg production and the colony starts to grow in number to get ready for Spring. Most queens are egg-laying machines, capable of laying up to 2000 eggs per day. When a hive gets too full of bees, spring fever hits and the colony makes preparation to swarm. Swarming is a natural reaction to over-crowding and is the typical way the species propagates. The old queen and a bunch of workers (half give or take) will leave the hive and find a new location. 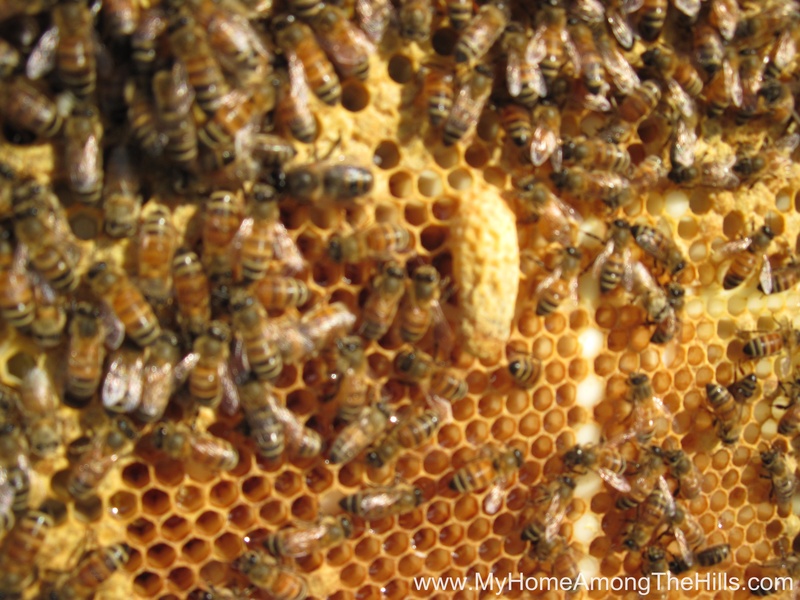 Prior to leaving, the workers make several queen cells (they feed fertilized eggs/larvae the proper amount of royal jelly and the larvae will turn into a queen) so the remaining colony will still have a queen after the swarm leaves. Note the white larvae. Once the eggs hatch, the resulting larvae eat and eat and grow into pretty large "worms". They eventually are capped over (see above picture) and pupate. This stage is the conversion from "worm" into bee. An observant beekeeper will watch for the Spring build-up and may consider splitting a colony that grows too big. Swarms are a lot of fun to watch and to catch, but a beekeeper runs the risk of irritating his neighbors or losing the colony to the wilds. 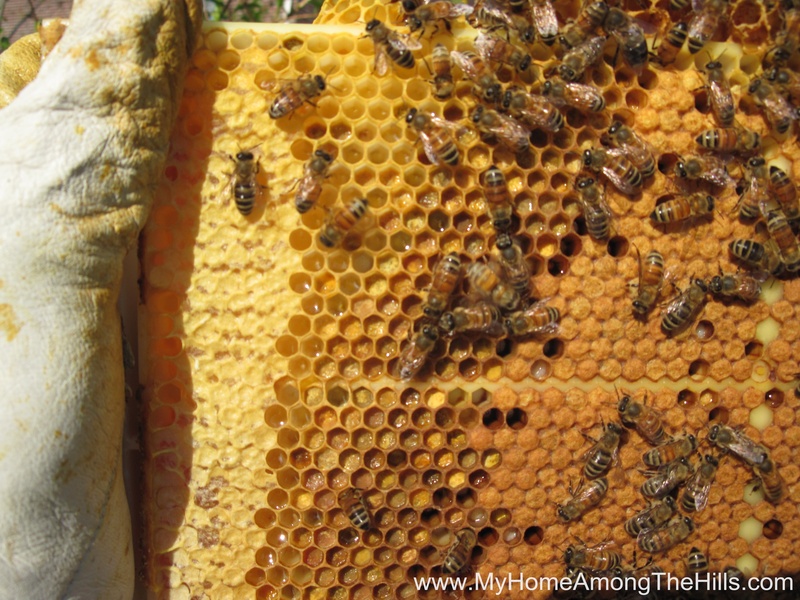 I prefer to split a colony before it gets the urge to swarm so I can retain all of my bees. So, last night I split a few of my “booming” colonies. 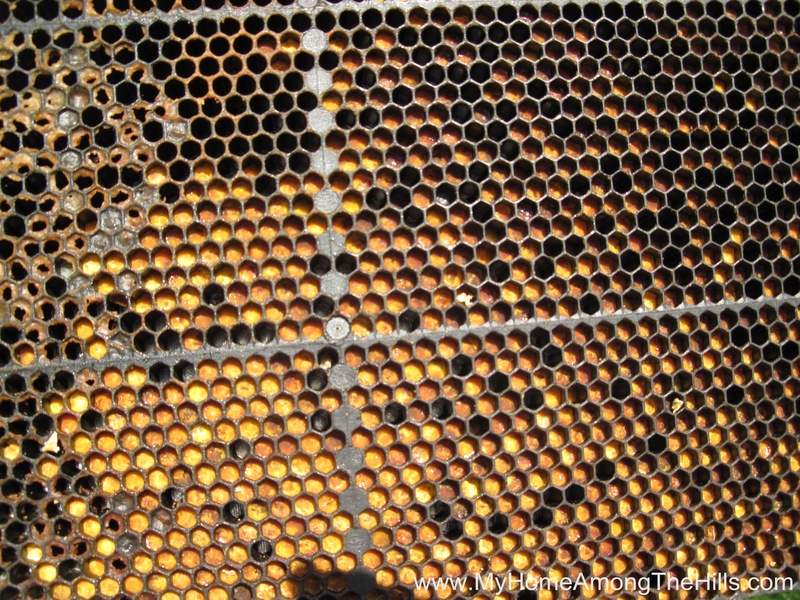 I simply take 3-5 frames with a mixture of bees, brood, eggs, pollen and honey and move them to a different hive box. I make sure to leave the queen in the original location. The original colony will remain strong as the queen finds she has lots of room to lay more eggs (in the empty frames I put in place of the ones I removed) and the colony will make lots of honey. Notice the different bands...the outer bad has a somewhat wet looking yellow cap over the honeycomb. That is capped honey. Inside of that is a yellow paste down inside the cells. That is stored pollen. Inside of that band is more capped brood. 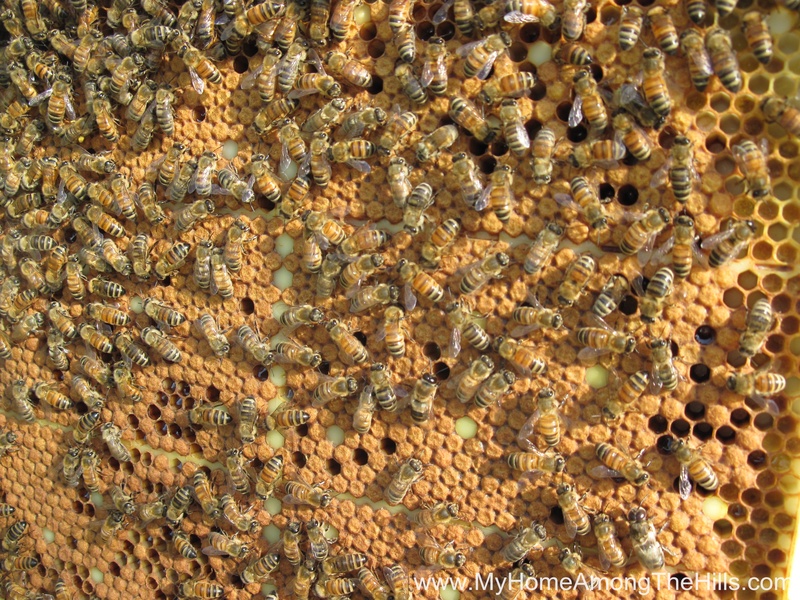 The "nest" always has these bands of honey, pollen and brood. The new colony will feed royal jelly to a number of eggs (in essence, making their own little swarm condition without actually flying off) and end up with a queen in 3 weeks (if all goes well). The split probably won’t make honey this season as they have to hatch a queen and wait for her to get to full egg-laying capacity, but they should be strong going into the Fall. I was able to find a few queen cells in the original hives so I took them and put them in the splits so I know there is a queen already pretty far along in the development process. These splits have an even better chance of having a good queen and growing rapidly since they won’t suffer the 3 week delay to make a new queen from scratch. Too bad it is blurry but this is one of the queen cells I found...a new queen in the making! I make splits every year and have great luck at it. I will probably re-queen these splits later this season or maybe next spring as I want to maintain genetic diversity, but in the short term, I now have more colonies than I did 2 days ago and I will almost assuredly make more honey than I otherwise would have made. Honeybees are so cool! Oh yay bee time! Love all the pics. Hey, do you have any suggestions for my 4 year old? He’s suddenly developed a crazy fear of bees. Not sure where it came from – no one else is afraid of them. But it’s gotten to where he doesn’t want to go outside, and when he does he just stands right by the door and looks terrified 🙁 We have a ton of bees at our place, so he’s going to need to get over it! Looks like Abigail is swimming in bees. Is she hold up a frame with the bees on it? She isn’t afraid of being stung? Neat. 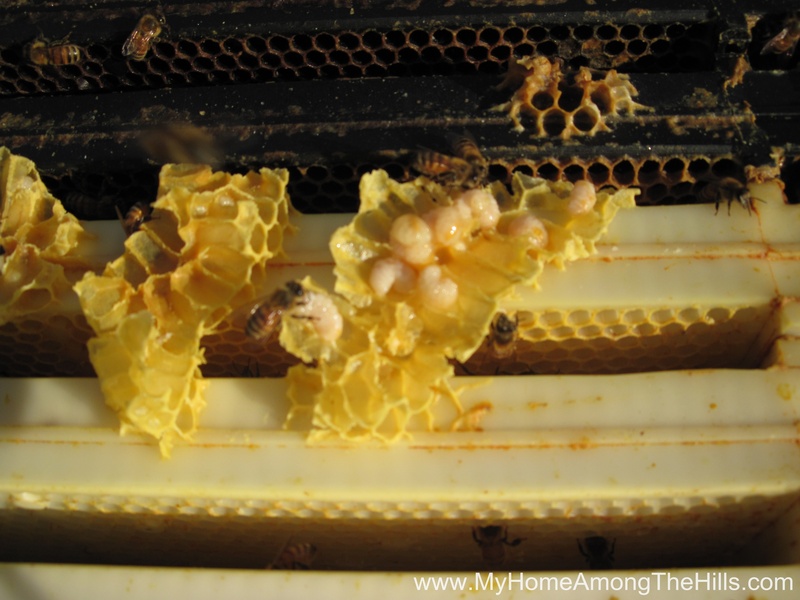 As a son of beekeepers, this is one of the better posts I have seen describing colony dynamics and the differences between honey, brood and pollen cells. I have explained it many times over many years but it seems like where I lose people is when I start talking about royal jelly and its function. I’ve always thought they need to give it a better name so people will believe me when I tell them I am not making this up. What a great helper you have..and beautiful too. The pictures are very helpful. I did see a few capped brood cells but most were empty. I probably should have looked real close to see if there were eggs in them. I guess if they are all laid the same day..they would emerge about the same time and that could account for so many empty cells. I have a Queen coming in the morning. When I open the hive to install her…I will do a better check. If there is nothing in the cells I will install her. If there are eggs..then I will see if my neighbor needs another Queen. I enjoyed the post. Glad you pointed out the 3 types of cells on each frame. Cool!!! Thanks for sharing. I’m so thrilled your kids are getting into the act. 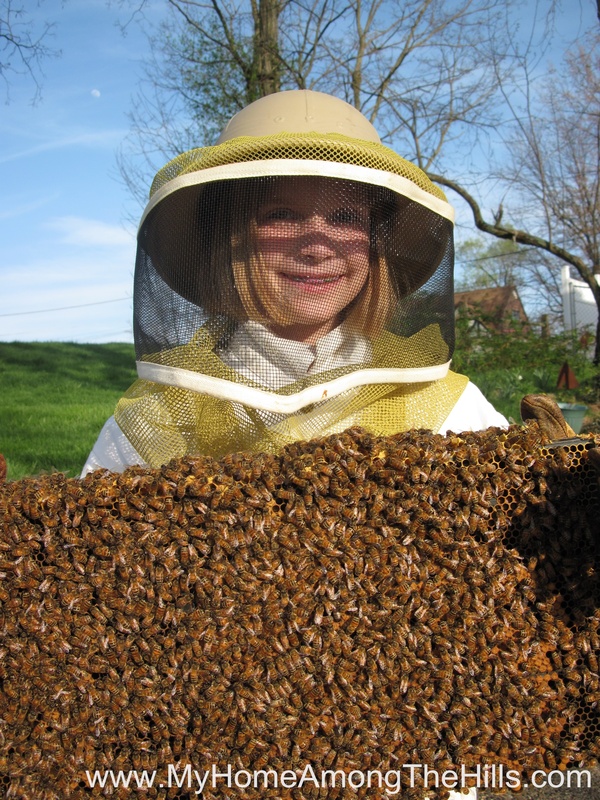 Another generation of beekeepers. How cool to get to see all of the different stages that bees go through with your pictures! How many bee boxes do you have? I’m just wondering now too if you have a picture of a wild nest of honey bees that you have found. I’d like to see that just for reference if I should find something like that around my place. I’d have you come and get them!